I didn't really know what to expect coming to Boise... Scratch that, I kinda did. My flight over which was filled with triathletes sitting next to large bearded men in suspenders and flannel pretty much confirmed my suspicions. However, what I DIDN'T know what to expect was with regard to the conditions come race day. Two years ago it was really cold. Last year it was really hot. Every year it is really windy. I was hoping for a Goldilocks effect of "just right". The morning before the race I loaded my bike up and went down to the expo to check in and I thought I would have the on-site bike mechanic evaluate my bike reassembly skills. You see, I'm pretty confident I did okay, and likely would have foregone the professional bike check if it were a flat course. But considering that right out of T1 we would be going into a blazing fast descent, I thought it to be better safe than sorry, lest this happen to me. All systems were go, and I dropped off my bike at Lucky Peak in T1 for a slumber party with 1400 of its friends. Then my wife and I were off to enjoy our pre-race dinner ritual, sushi! Now, sushi in Boise. Our first mistake was to try to make that combination work. Don't get me wrong, I'm sure that there are plenty of good sushi places in Boise. But at 6 pm on a Friday night without knowing the area, this is a decision you do not want to rush. So we honed our Yelping skills and drove by a number of supposedly "decent" places only to find they were all in less than stellar areas. 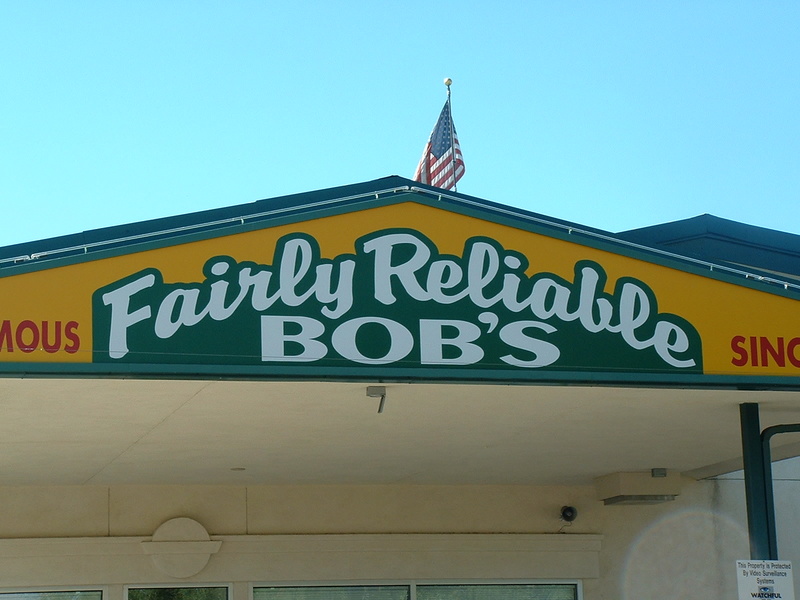 The last one we went to was across the street from two strip clubs, and adjacent to a used car lot called "Fairly Reliable Bob's" (no joke). We decided to skip sushi this time around. We ate elsewhere and went back to the hotel to sleep. This was the first time I was able to wake up with the sun shining on race morning. All other races tend to start around first hint of corona over the horizon, but this race starts at high noon. And being a wave start, I wouldn't go off until high noon thirty. Many people praise the late start as a way to get a full night sleep, sleep in, and eat a full breakfast. I couldn't disagree more. First off, I like to get my suffering going as early as possible. It adds to the experience. Second, I don't find it wise to go into a race with a full belly of complete breakfast. I opted to go with my usual, and have a shake for breakfast and some quinoa and oatmeal a couple hours before the start. Swim: 38:41, 58/194 in AG, 399/1435 Overall - Man, I need a swim coach! Our wave, the 35-39 male age group, was the 8th wave to go off, so there would be plenty of traffic on the course by the time we got out there. Unfortunately, we had no time for a warm up, so immediately when we got in the water I started bobbing my head in and out to get my face used to the water and through the panic of the cold. Fortunately it wasn't as cold as it was in previous years, only about 60 degrees (I'd heard stories of it being in the low 50's). Rounding the first turn buoy, it became harder to swim with forward progress. It felt like the current was against us, which was probably correct, since the wind was pushing at our faces. I began to swallow a lot of water because I was breathing out of my right side, which was where the wind was coming from. At about the third turn buoy, I began to get pretty bad cramps in my calves. This had never happened to me in the water before and was quite unnerving, since I could no longer straighten or bend my foot. It just sat there like a painful brick in the water. I did my best to try to work it out and swim on, but it continued to persist. Right as we hit the dock, with about 20 meters to go, it seized up really bad and I sat there floating right at the end of the swim, unable to move, while trying to stretch out my calf. I dog paddled the rest of the way to the swim exit, and stood up, fully expecting to fall down again in a heap of uselessness. To my surprise, all systems were working properly, albeit a bit sore. Despite the hiccups, I was expecting to see a swim time of 38 minutes, and that is exactly what I got. Still a little disappointed that I haven't had any improvement since my last half in December (hence the comment above - I really need a swim coach!). There was a bit of a hill running from the swim exit to transition, and naturally my heart rate reflected the shock of moving from upper body to lower body activity. I bypassed the wetsuit strippers, as I couldn't justify them saving me any time, and continued on to my bike. I'm sure I could have gone faster, but I still haven't mastered the art of the "clean transition". This requires that all swim items be put into the bike bag, and I am still pretty slow at that task. But, I grabbed my bike and headed out. There were only a couple climbs on this course, and the first began about 3 miles in. The course was still congested here, but the slow and safe pace provided a good opportunity to pass a lot of people. My heart rate during this climb was at the high 150's, which is too high for a half Ironman, but I figured I would take it back once I got to the flats. I did that and averaged a heart rate of 151 over the course of the ride. One of the things I found challenging on this race was staying well hydrated enough. I used the same setup I had in Mexico, which included a cage on my aero bars, and one in my seat tube. I would use my nutrition in one and water in the other. I was fully expecting that they would hand out nice water bottles like they did in Mexico. 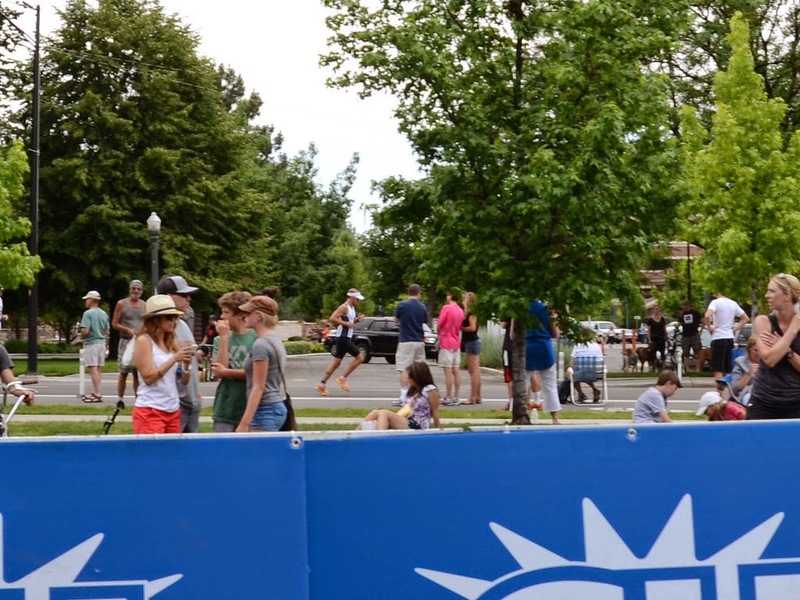 In fact, I started with my "Ironman Los Cabos" water bottle, which I planned to discard at the first aid station and replace with a nice, new "Ironman Boise" water bottle. Unfortunately, they chose to go with the cheap plastic Arrowhead bottles, which did not fit in either cage. Reluctantly, at the first aid station, I traded in my nice Cabo souvenir for a $1.00 generic Arrowhead light plastic bottle. 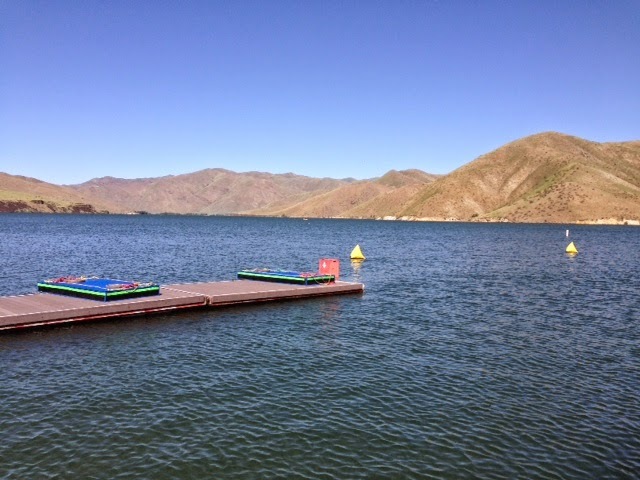 The aid stations were spread out farther than Cabo as well, which meant I had to make the water go farther. Throughout the whole bike I felt like I wasn't hydrating well enough. This was certainly a learning experience for Boulder, which will likely have the same spread of aid stations. This, along with the cramping calves, would haunt me on the run. Also had a quick pee break, since I didn't pee at all on the bike. I could tell now that I was clearly dehydrated, and my stomach was cramping pretty badly (not due to nutrition this time, but due to lack of hydration I believe). I would only be getting water from the aid stations, and taking eating gels and salt individually during the run. This was also a test run for Boulder. In Cabo I had a fuel belt with all of these items mixed together for easy consumption. Only problem was I had to lug around a Batman-esque utility belt for 26 miles. I wanted to see if I could get away without the belt this time around. Immediately a few things began occurring to me as I went out on my run. First, my legs were already jello and my calves were screaming with every footstrike (leftover trauma from the cramping on the swim). Second, my stomach was not liking me. It didn't seem to be the nutrition this time, but likely the dehydration combined with the new position of being straight up vs. hunched over. With these things already bothering me, I had an increased lack of focus due to the fact that I had to fiddle with a sandwich bag of 6 gels and salt pills. I tried desperately to stuff these in my pockets, while running, while tired, and I was having a really hard time of it. This experience taught me that at the very beginning of the run, you want to do nothing else except for focus on getting your legs under you. Every other little thing you do just magnifies the suffering. It took me a long time to find my rhythm. Based on my training, I had hoped to get onto the run and tick off 7:15-7:20 miles. But I was in the high 7:30's, and I had to struggle to maintain that. By the second mile, I decided to walk the aid station, get some fluids in, and collect myself. I did so and I started feeling a little better, but not much. I felt good enough to maintain my high 7 minute pace. I had a chance to pass a number of other runners, and the common theme was that nobody looked exceedingly strong. Actually, everyone looked pretty beat up, which told me that I was not alone. The bike must have kicked a lot of butts. By around mile 5 I felt that my cramps had finally left me for the most part. My jello and crampy legs were still with me, but it was a bit of a morale boost for me. I was able to maintain the pace and pick off some more runners. As I approached lap 2, I caught up to some of the pro women who were about to finish, but the announcers at the finish line were all about "Ohno". They were letting the crowd know that he had just passed through the 8 mile split, and he was due in within the hour. My math told me that I was catching up to him. Not that it really mattered either way, but it's always nice to give a former Olympian a pat on the back for conquering a new challenge. I was continuing to maintain my pace through the second lap, but as my heart rate began to accelerate, and fatigue began to overtake me, I got that ever demoralizing late-race apathy. I was so tired, and couldn't take any more calories in, couldn't drink any more water, and so I began getting the attitude of "who cares?" At that point it didn't matter to me how I finished, or if I walked the rest of the way. I just wanted to be done. There is a moment when this happens in all endurance races, and at that time it is best to trick your mind by bargaining. I would tell myself that I would run to the next aid station and then walk, and once I got there I would keep going and set a new target and repeat the process. This is related to something that works in recovery, "a day at a time". We don't think about what the future brings because it brings us demoralization. Instead we think about just this moment right now. And at that moment right then I was going to run. As I ran under the bridge the last time, I thought I would just have to make a turn up the hill and run to the finish. However, in my delirium I became confused. Once up the hill I was following a guy who looked very confident to be going the right way, but it was in the opposite direction of where I thought the finish was. Nobody in the crowd seemed to be telling us we were going the wrong way, but I still had to slow down and yell the question to nobody in particular, "am I going the right way?" We were running in the very same place we started the half marathon, and the prospect of doing another lap wasn't an option. 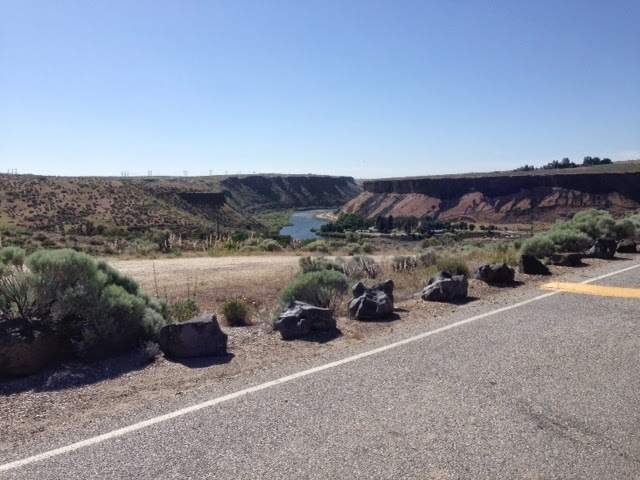 Turns out I was thinking that T2 was the finish line, but was actually on the other side of the river from the finish. We were simply crossing the river toward the finish, but it felt like forever. Finally I turned down the finishing chute and looked up at the time to see 5:23 as I crossed the line. By my math (since I had started 27 minutes after the gun), I was under 5 hours by a few minutes. A lot of pain, but I had persevered and achieved my goal. Official time was 4:57:09, which gave me 20th place in my age group (out of 194), and 102 overall (out of 1,435). 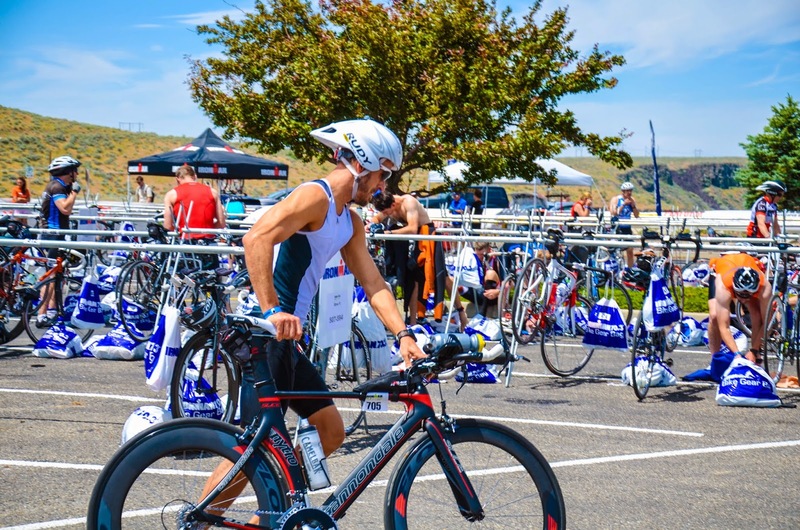 I didn't catch up to Apolo, and he did very well for a first triathlon, finishing in 4:59. With a few months until Kona, I think he will do very well there (and I hope to see him there!). The grassy area outside of the finish line looked like a war zone medical tent, where the wounded soldiers were clad in Lycra rather than camouflage. A lot of people, more so than Cabo, were woozy and laid out on the grass trying to collect themselves. A lot of people seemed to put it all out there, including myself. I was one of those laying on the grass, trying to decide if horizontal or vertical was the better position to avoid puking or passing out. Eventually I came around and got a massage (more props to the volunteers who freely gave of themselves to touch numbers of sweaty triathletes after a 5 hour race). Then I heard the 5 greatest words you can possibly hear after a long triathlon, "They have burgers over there". You have to love a race that is sponsored by "Beef". Yes, "Beef". While I tend to stick to fish and eggs as animal protein during training, post race it's all about red meat and gluttony. I'm sure many vegans didn't appreciate this, but I sure did. It was awesome to have a couple of free burgers and beef jerky at the end of the race.